If we as a people, are to move forward, it's important that core issues are addressed from all walks of Ireland society. UnitedPeople is doing this today. There are other issues that don't grab big headlines. As a media topic, they are considered less attractive - but are just as important to many everyday lives. UnitedPeople is out to tackle them head-on. The goal is to assist and create more positive steps forward. 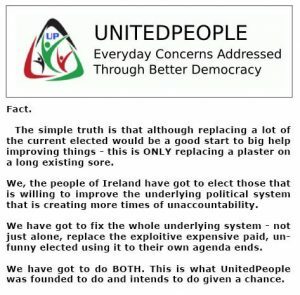 UnitedPeople is only just starting out. We are aware there are more issues to be tackled and we are ready for the challenge. Every step forward, is positive progress itself. Sometimes we might step big and sometimes small - but the aim is to keep moving forward. That way, the lives of Ireland's people improve by moving in the right direction. Childcare credit and costs need to be better addressed. TD's wages and expenses lowered. Elected are there to serve the people - not serve themselves. The log in/out system at the Dail needed to be better used. There is no accurate records or better accountability with the current system. A public referendum if to accept the TTIP Trade treaty or reject it, if already forced in without a citizen direct vote on the matter. Immediate and unrestricted access given to independent, outside agents investigating NAMA. Change the way NAMA operates, so that owner occupiers to have first option on the purchase of a NAMA controlled property. Where occupiers can afford to be part of a new state scheme, the instigation of state purchase grants for that occupiers in trouble over speculative property deals. Councils at local and national level would have greater ability to hire direct, more staff in the area of plumbing, carpentry and electrical roles. The return of state apprentice opportunities would also follow from the return of state employees taken on over outside private profiteer companies exploiting funds. An end to the continuing back-door privatisation of state departments and the services they once carried out themselves. To do this we would also instigate work creation with state contracts in direct employed, fresh trained and already skilled employees. Councils at local and national level would have greater ability to hire direct, more staff in the area of plumbing, carpentry and electrical areas to begin with. We seek a lowering of angler's fees which has turned the sport often into a rich person’s pastime. The high costs at times involved with angling (including fishing licenses) is said to be having an effect on tourism. UnitedPeople would like to address this through further consultation and department assistance. We would like to see Ireland able to capitalise on both levels of local and national fishing industry in regard to tourist activity. Over all, there should be greater investment into sport tourism. The knock-on advantages to the national exchequer could come in many ways including through increased local employment across Ireland. Through cross-consultation, more use of our present national sport facilities for holidaying Ireland and foreign citizens visiting. UnitedPeople would like to see a greater state effort in providing attractive leisure facilities for those more senior in age. As seniors are generally living longer, their ability to travel extends to their later years. It would be remiss of the Irish tourist industry not to provide accommodating facilities. Instigation of repair and improvement works by local and county councils on historic buildings and ancient monuments. Places (example; Saint Michael medieval gatehouse, church and grange in nearby Duleek in Meath) if cared for better, that could be of greater cultural and tourist value. Ireland has many historic assets. some have yet to be enabled to their full potential. To carry out the aforementioned, we would see that local and county councils have an accountable section with the appropriate staff, to safeguard our historic locations. They should be working in conjunction with our state tourism sector, to utilise to best degree, additional employees. UnitedPeople would like to help tourism entrepreneurs in creating new directions and attractions in Ireland. More state bureaucratic, transport and other logistical support is required. When done well, Ireland as a whole, gains. UnitedPeople regards greater transparency and the re-introduction of Participatory Democracy as a must. It is a UnitedPeople constitution, enshrined aim. We seek the introduction of postal voting for Irish emigrants as well as for the elderly and the disabled. This should have introduced long ago. The continued existence of many rural post offices is vital. Part of Ireland's unique international seen character comes from its many rural communities. The continued survival and hopeful re-insemination of once emigrating family members, therefore is important to continuing this aspect of Ireland society and outlook. In general, more practicable application of rural survival initiatives must continue and increase. Not to do this, would be further rural society and economic suicide. UnitedPeople wishes to boost our rural communities in vitality and utility. The immediate granting of citizen rights to those who have a PRSI number & have worked/contributed to the State for at least 5 years – once assessed as not a risk to state stability or to fellow citizens. The immediate introduction of an annual 'Passport Retention Tax' for those who choose to reside outside the Irish State for tax avoidance reasons. Open monthly meetings of all county cross-party elected TD's for the discussion & agreement of issues facing a particular constituency. To overcome that some town or county councils are operating unofficial pacts, to control or limit others access to positions including Mayoral roles, UnitedPeople would further introduce clearer, honest democratic reforms so the public gets to decide who should be top representing them more locally. UnitedPeople stands for the rights of individuals as a precautionary principle. The rights of citizens should therefore not downgraded or denied for the sake of profit over people, openly or by back-door quiet process. Further legislation on this would be created to act as a further fundamental guarantee. UnitedPeople seeks the immediate reintroduction of the Bereavement Grant for those below a range of savings/income. We seek also, the immediate inclusion of the self-employed for a wider range of state available benefits that others not self-employed, presently can avail of. There is still an unfair balance in this area. To assist both staff and public, we would like to see the creation of a single social welfare form, to simplify an application for any form of social welfare. UnitedPeople seeks the proper restoration of the One-Parent payment. Government and civil service pensions should be more coordinated and fair balanced, for people who retire early. UnitedPeople seeks full restoration of fuel, clothing and footwear, carer’s, phone, child and disability mobility allowances. Too many consecutive governments continue to first target social welfare recipients during an economic downturn. They overlook larger financial numbers lost though poor practice of chasing revenue that is regular owed by tax dodging multi corporations. They pick on the smaller, more defenceless citizens while turning a blind eye to larger culprits. 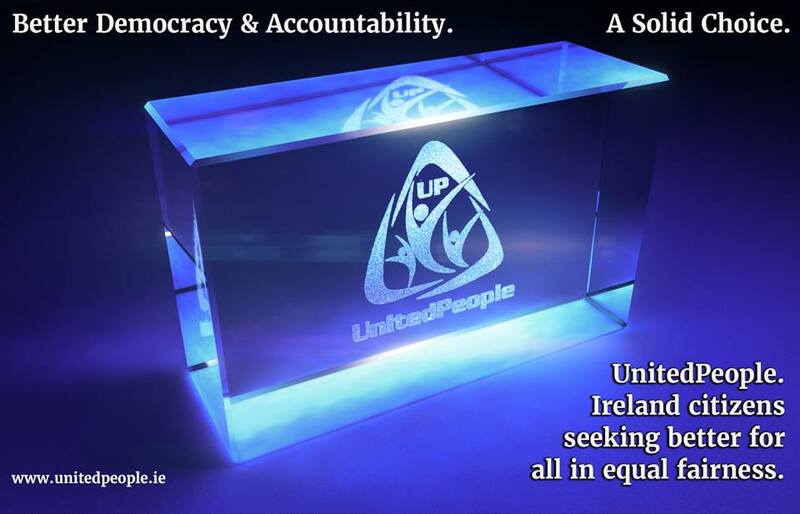 UnitedPeople hearing the citizens of Ireland tiring of this, would like to restore a proper balance of accountability. UnitedPeople without question would restore the allowance for elderly phone use and improve said allowance to take into account internet access also.